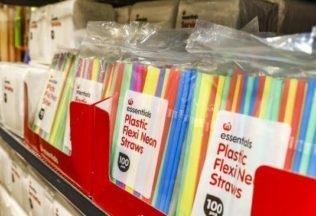 Supermarket giant Woolworths has pledged ​its commitment to phase out selling plastic straws, and plastic packaging in fruit and vegetables in its latest announcement on the stores sustainability initiative. Anyone providing the supermarket with drinks that come in a juice box will have to re-think how they package, as plastic straws are sucked out of Woolworths shelves. On the eve of World Environment Day, Woolworths Group CEO Brad Banducci made the announcements today at an industry sustainability event hosted at the Group’s headquartersin Bella Vista, Sydney. By the end of 2018, all stores within the Group in Australia and New Zealand will no longer sell plastic straws – saving 134 million plastic straws from going into circulation each year. With the nationwide phase out of single-use plastic shopping bags on 20 June 2018, Woolworths Supermarkets will offer a new green reusable shopping bag – with a lifetime replacement offer – for customers to purchase. All money made from the sale of the Bag for Good in FY19 will go towards the Junior Landcare grants program. In an ongoing effort to remove unnecessary packaging in produce, Woolworths is committed to trial the removal of plastic packaging on a further 80 lines over the next year. This will build on the 140 tonnes of plastic saved in the fruit and vegetables range in the last year. Woolworths Supermarkets want to have a 100% food waste diversion partner by the end of 2018. Woolworths will lead the establishment of a new Packaging Coalition Roundtable bringing together government, NGOs and key industry partners including Unilever, Nestlé, Simplot, VISY and the Australian Packaging Covenant to find ways to move towards a circular economy in Australia. “In the last year we have seen a shift towards more sustainable attitudes from our customers and the momentum is growing, with recent research showing a 15% increase in Australians now saying that taking care of the planet is important to them,” said Banducci. “Today’s initiatives represent further small, but important, steps in our commitment to make positive change happen. We understand the journey towards a more sustainable future has its challenges, but together with our customers and industry partners we are committed to moving our business, our country and our planet towards a greener future,” he added. Apart from Banducci the panel included Angus Harris (co-CEO Harris Farm Markets), Anthony Pratt (executive chairman, Visy Australia & Pratt Industries), Claire Peters (managing director, Woolworths Supermarkets), Clive Stiff (CEO Unilever, Australia and New Zealand) and Paul Klymenko (CEO Planet Ark Australia Foundation).